Hello again! I have returned from my internet break and I am so excited to be back to sharing the things I make with you! This painting is something I did while on my hiatus. I was at home in the British Columbia mountains with my mom this August, and we were feeling the need to get creative. My mom is an incredible painter. She got back into painting about 5 years ago and I love coming home to see all the new works she has done. This last trip home, she really inspired me to pick up a brush again. My mom working on her painting of a vineyard in the Okanagan Valley. This painting is a square acrylic on canvas. When choosing a photo to paint, I wanted something with colours and texture. 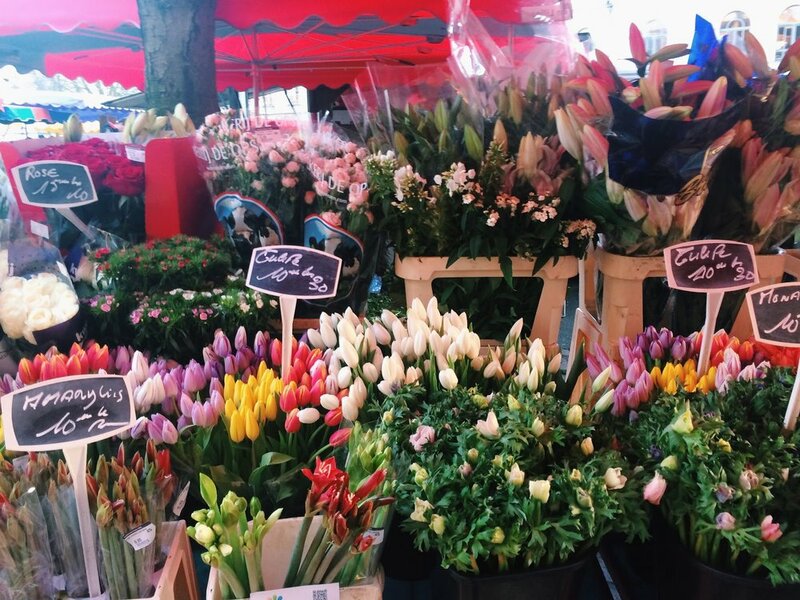 Flower Market in France is based on a photo I took during a study abroad term in France. I was travelling with a friend in Lille, and we were walking from our hostel to find a café for breakfast before heading to the train station. We stumbled across an early morning market and I fell in love with the bunches of flowers at this stall. This photo brought back lovely memories and I thought that the flowers could translate to the canvas in a cool impressionistic style. The photo I took in France and based my painting from. It had been a while since I last painted. I really love impressionism because it uses quick and loose brush strokes that let you get back into the feeling of painting. My mom has attended many painting workshops and retreats, so it was really lovely to spend an afternoon learning techniques from her and finding my inner painter once again. When starting the canvas, she told me to prep it with loose big brush strokes in a crosshatch kind of pattern. It was also best to use a colour that contrasts with the main colours of the photo. I actually started with a neon yellow-green colour, then added a bright red over top. With the red overlaying the yellow, the canvas had a nice orange glow. Then I used a dark purple on the canvas for the dark areas in the photo. Once the general shapes were on the canvas, I started to add more browns and greens for the sharper edges and the lines of the stems. Then I used smaller brush strokes to create the blooms of the flowers and to continue to build the shapes on the canvas. This method of painting gives a lot of shape and depth to the canvas. Nothing is perfectly contoured and filled, and if you hold my canvas up to the light you can actually see the neon yellow peeking through certain areas. I love the texture that is created as well. Painting is a great exercise in seeing light and dark areas in a picture and learning how to translate them into a new image. It is also a great exercise in learning not to overthink an image. I finished this painting in about 2 hours. I used loose brush strokes and went with my gut for what colours to mix and use. It was so fun. Alas, another hobby to add to my never-ending list. I hope you had a beautiful August! I am looking forward to being back into making things on a more routine schedule. For this fall and winter season, you can expect more variety of things I handmake, continued updates for The Makehouse, and some fun themed projects to inspire you for the upcoming holidays. Oh, how I love fall. Here is to cozy days and lots of making!